Troubridge Island Lighthouse | Lighthouses of Australia Inc. The Troubridge Shoals, of which Troubridge Island is a part, are on the main route to Adelaide from the west known as the Investigator Strait. It is the passage of water between Kangaroo Island and the Yorke Peninsula. The shoal hugs the Yorke Peninsula and officially has been the cause of 33 wrecks and groundings, however, local knowledge says that the real figure is in the hundreds. In 1850, seven vessels ran aground in an eight-month period. 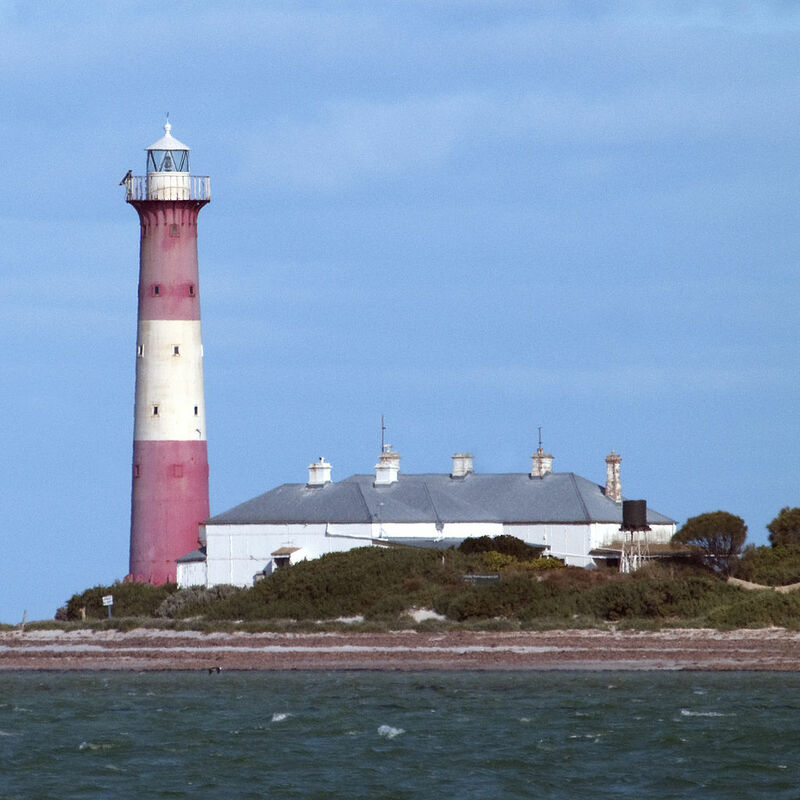 The Troubridge Island Lighthouse was completed in 1855, and was the second lighthouse to be built in South Australia, the first being Cape Willoughby on Kangaroo Island. It is constructed of cylindrical cast iron segments shipped out from Britain and bolted together on site. It is believed to be only one of two towers of this type constructed in Australia. The cottages were completed in 1856 and the light was lit. In 1882, the light was upgraded to a holophotal reflector apparatus and lantern. At the same time the telegraph cable was laid from Edithburgh to the lighthouse to enhance communications. In 1899, a fixed red light was added to the platform of the Troubridge Island lighthouse. Between the years 1925 and 1931, a 2nd order Deville lamp and a 2.19 metres Chance Bros Lantern were installed and the operation electrified. The power was provided by a petrol generator. In 1956 the light was again upgraded to a 1,000 watt, 120 volt tungsten halogen lamp and had an intensity of 480,000 candelas. This increased the range from the original 10 miles to 25 miles. Power from the 2 new diesel generators meant the cottages could electrified for the first time. Also the light tower was repainted from the original colours to bright red with a white horizontal band as a day mark. The generators were again upgraded in 1976 and the telegraph link was upgraded to a radio link. In the late 1970s, it was decided to build a new lighthouse on Troubridge Hill. The new light was completed in 1980 and in 1981 the Troubridge Island light was downgraded in power, automated and demanned. In 1982, the island and lighthouse was sold to the South Australian Government who wished to create a bird sanctuary. 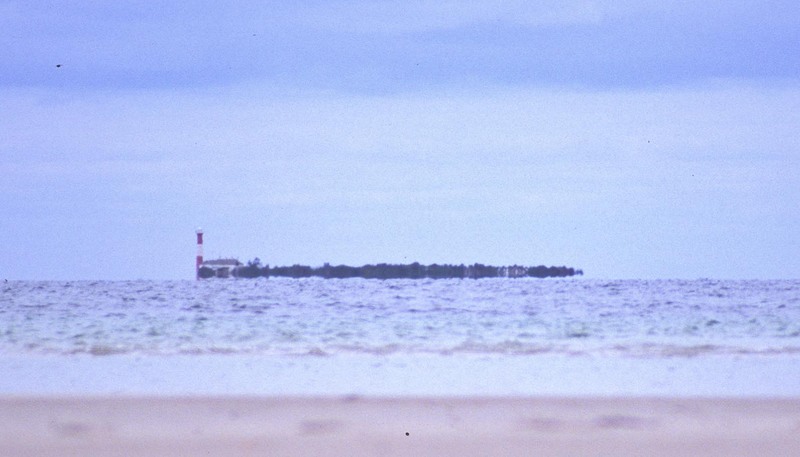 The light was extinguished in March 2002 and replaced by a beacon on Marion Reef. It was ironical that this was the the very same month that Australia Post honoured the light with a postage stamp. The future of this light seemed doomed from its inception. When Matthew Flinders, who named the shoal, reached the area in 1802 it was just a sandbar on a limestone reef. By 1838 it had developed into a small islet, 600 metres long by 300 metres wide. This was further stabilised between 1856 and 1885 by vegetation brought with the lighthouse keepers to plant for their gardens and also to protect the cottages from the elements. Within 20 years of establishment of the lighthouse massive erosion had reached the base of the lighthouse. A breakwater that had been built in 1858 was found to be ineffective and after an 1868 winter storm work had to be undertaken to underpin the foundation of the lighthouse. An earthquake in 1902 shook the lighthouse, causing a fire to start in and destroy the lantern room, and damaged the foundations. The lantern room was immediately repaired and refurbished and brought back into service. The foundations of the tower and cottages were not repaired till 1904. Despite the fact the size of the island is now 800 metres long and 400 metres wide the lighthouse is still threatened with continuing erosion as the island moves and reshapes itself. It is interesting to note in comparing the first of the prints taken in the early 1900s with the photograph from a similar angle below that the first was taken on land and the current one was taken from a boat! Troubridge Island lies almost 6 kilometres east south east off Edithburgh on the Yorke Peninsula. Tours are provided on public and school holidays by Chris and Judy Johnson of Troubridge Island Hideaway in Edithburgh, subject to weather conditions. Accommodation is available. This lighthouse is very much under threat. The erosion has now reached the base of the lighthouse and in the winter high seas the foundations are threatened. No clear plan has been resolved on how to deal with this situation.